I actually knew what to look for! At only about six inches, the lizard was a bit smaller than I expected, but only because I hadn’t read the size information in the guidebook carefully. (They grow up to eight inches.) It was scurrying around the stone planter/ledge at the edge of lodge’s patio, with a special affection for a wooden gecko at the center of the planter. The gecko, at three feet or so, was much larger than the three-eyed lizard, and apparently good at holding the warmth of the morning sun. If you are looking for the third eye, hone in on the dark brown spot on the top of the lizard’s head. 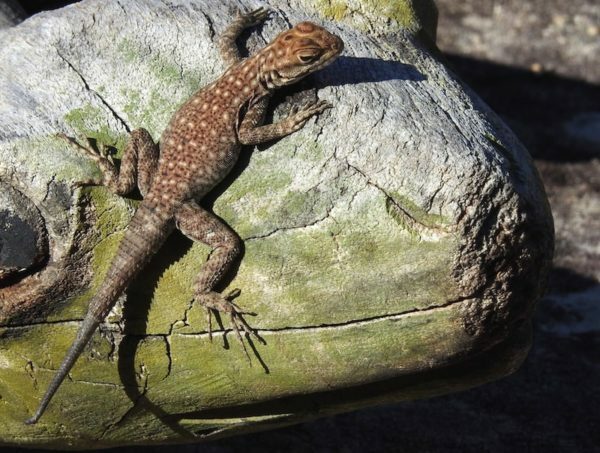 That’s it: a little agglomeration of photoreceptors that don’t make out all the detail that the lizard’s two true eyes do, but can sense changes in light when predators pass overhead. So, probably not as creepy as you expected when you opened this post. Or maybe you always think photos of lizards are creepy. If the latter is the case, I guess you’ll just have to trust me that the three-eyed lizard is quite adorable in person.